Miss Baldur's Gate and Icewind Dale? View ESRB's rating information for this game. Platforms: Windows PC, Macintosh, and Linux via Steam and GOG. "It's the best new, isometric RPG to come out in years. While Pillars of Eternity is certainly banking on a nostalgic fan base, it's still an excellent RPG in its own right. It's a game rich with player agency, giving you tons of control to craft your story or explore different solutions to the presented problems. You know, actual roleplaying not simply a game with a leveling and stat system stapled on." "This is a big, fat, deep adventure that lets you carve your own unique path through a fantasy world that’s been brilliantly brought to life with rich, evocative writing. It’s a game steeped in a bygone era of computer RPG design, but somehow it doesn’t feel archaic. Obsidian have always been bound to other peoples’ worlds—Fallout, Dungeons & Dragons, Star Wars, South Park—but in creating their own from scratch, they’ve made not only their best game to date, but one of the best RPGs on PC." "It’s a triumph. A wonderful, enormous and spellbinding RPG, gloriously created in the image of BioWare’s Infinity classics, but distinctly its own. A classic in every sense." Eternity aims to recapture the magic, imagination, depth, and nostalgia of classic RPG's that we enjoyed making - and playing. At Obsidian, we have the people responsible for many of those classic games and we want to bring those games back... and that’s why we’re here - we need your help to make it a reality! Eternity will take the central hero, memorable companions and the epic exploration of Baldur’s Gate, add in the fun, intense combat and dungeon diving of Icewind Dale, and tie it all together with the emotional writing and mature thematic exploration of Planescape: Torment. Below are the minimum and recommended system requirements for Pillars of Eternity on Windows, Mac, and Linux. Note: We strongly recommend playing Pillars of Eternity on a 64-bit based operating system. Note: Pillars of Eternity does not support case-sensitive formatted volumes. When will Pillars of Eternity be released? Pillars of Eternity was released on Thursday, March 26, 2015. When will the Backer Beta be released? The backer beta was released in August 2014 and is available to backers who purchased the $110 tier, or is available to existing backers for $25 through the Backer Portal. The Backer Beta is no longer supported however. How will I get my digital copy of the game? We proudly support both GOG and Steam, so if you prefer DRM-free, you can choose the GOG option, and if you like Steam's integration, including achievements and cloud saves, you can choose choose that as well. You can redeem your digital goods on the Products tab of your Account Profile. Simply browse the item you'd like to redeem and a button will be available for you to download your items and/or generate keys. If you bought additional copies as add-ons, you'll can generate additional keys in the Products tab as well. These show up as multiple copies of the game. When will I get the rewards listed the Pillars of Eternity Kickstarter page? All backer items have shipped. If you haven't received your items yet, please make sure you've completed your pledge order by visiting the Backer Portal. If you have completed your pledge order and the status is still 'Shipping' and you haven't received an e-mail message from Paradox, please feel free to contact us and we can check on the status of your order. What languages will Pillars of Eternity be in? The initial release is in English, French, German, Spanish, Italian, Russian, and Polish. Korean is also now available on Steam. 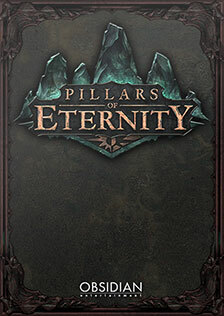 Using the Unity game engine, Pillars of Eternity supports Windows PC, Macintosh OS X, and Linux. Neither consoles nor mobile devices are supported. What file formats will the Digital Download of the Soundtrack be available in? Both MP3 (compressed, common music format) and FLAC (lossless) formats are available for the soundtrack. What is the difference between the Strategy Guide, the Collector's Book/Guidebook, and the Campaign/World Almanac? Strategy Guide (aka Collector's Edition Guide) - Tips and Tricks on how to play the game, from the strat guide masters at Prima Games. A limited edition print run hardcover version is available for a limited time, which includes backer credits! Collector's Book (aka Guidebook) - Art, Concepts, Making Of/Behind the Scenes, Monster Info, additional lore, and info on companions/characters. The hardcover version from Dark Horse Comics is also now available! Campaign/World Almanac - All about the World - the History and Lore of the world of Pillars of Eternity. This is unfortunately not available in print format. How many playable classes are there? There are eleven playable classes to choose from: Barbarian, Chanter, Cipher, Druid, Fighter, Monk, Paladin, Priest, Ranger, Rogue, and Wizard. How many playable races are there? Pillars of Eternity has six playable races. You can choose from the more typical fantasy setting races like Humans, Elves, and Dwarves, or some of the ones unique to Pillars of Eternity like Aumaua, Orlans, and Godlike. Does Pillars of Eternity have multiplayer support? No, Pillars of Eternity is a single-player only role-playing game.